Weddings What Do Society Darlings Nada Jumabhoy And Meaghan See Bond Over? What Do Society Darlings Nada Jumabhoy And Meaghan See Bond Over? Chaumet jewellery! During our Singapore Tatler Weddings Spring/Summer 2017 shoot, we mine the quarry of Nada and Meaghan's friendship and take a look at how 'sparkly' it really is. They say diamonds are a girl's best friend, but even better—what if you could bond over diamonds with your best friend? With Singapore Tatler's real life BFFs Nada Jumabhoy and Meaghan See, we see a scintillating rapport that likens to a piece of fine jewellery: beautiful and unique. 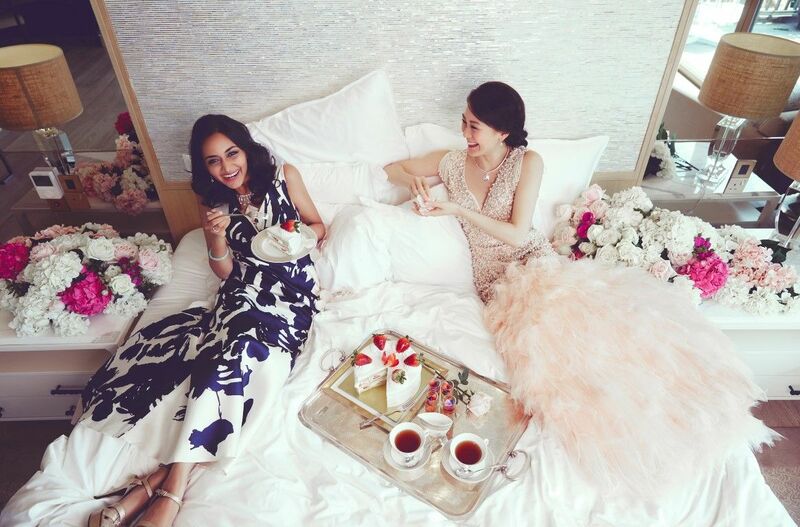 Join us as we go behind-the-scenes with Meaghan and Nada, as they fawn over stunning sparklers that they picked out from Chaumet for an editorial spread in Singapore Tatler Wedding's Spring/Summer 2017 issue. Nada Jumabhoy was seen wearing a Joséphine Aube Printaniere necklace in white gold with diamonds, the stunning pear-shaped diamonds on this piece, are strung along an equally dazzling neckline making for an statement piece that accentuates Nada's beauty with its delicate form. The dazzling necklace is an ideal piece to add to your collection for upcoming galas, soirées or weddings. On Meaghan See, we see the Hortensia Aube Rosée pendant in pink gold with diamonds, angel-skin and pink opals, tourmalines and pink sapphire.The pendant looks stunning on the young socialite with its incorporation of a powdery blush pink palette and glistening diamonds that come together to form petals. The floral creation projects a sense of youthfulness and innocence, so whether it's worn by a bride, her bridesmaids or the flower girl, the Hortensia Aube Rosée series can compliment just about anyone. Seen on both ladies is the Joséphine Rondes de Nuit necklace in white gold with diamonds, it is a definite eye-catcher with its layers of diamond frames that form a tear-drop shaped pendant. In this particular design, the pendant rests right under a diamond-lined choker that sits flatteringly on the décolleté, making it the perfect standout piece for strapless dresses—as seen on Nada, or dresses with a deep V-neckline—as seen on Meaghan. The Joséphine Rondes de Nuit necklace is a statement piece, perfect for the woman that always seeks for an additional touch of spark to her outfit.